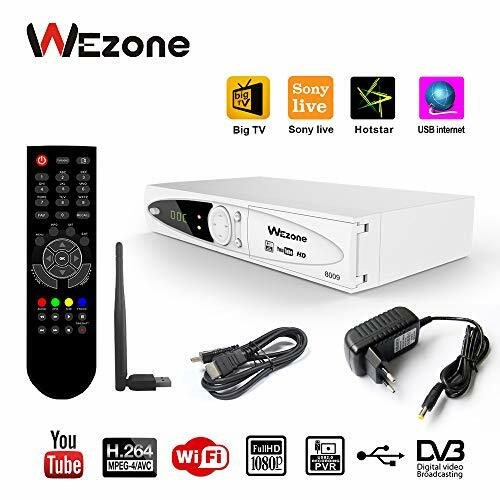 Wezone 8009 DVB-S2 Set Top Box is to receive Full HD Free to Air TV broadcasting, supports multi media, internet from mobile and PVR function, with best price and various functions. It is the best choice for home TV entertainment equipment. If you have any problems (like Return, Connection, firmware upgraded...), PLEASE send message in Amazon system. We will reply in 24 hours. pport DVB-S2/S digital TV signal modulated. No monthly charges to any cable/dish operator. View and store your favorite TV and Radio programs in USB. 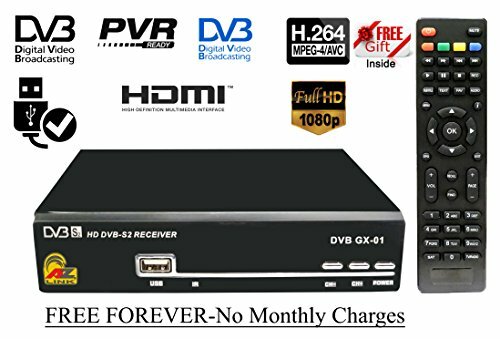 DVB-S2 Digital Satellite Receiver With Full HD 1080p for Free-to-Air Box with Wi-Fi Connectivity option via USB Wi-Fi Dongle. Auto/Manual Channel Search, Channel sorting, USB Recording of Digital TV / Radio, Parental Lock, Timer Setting, Display Program information on screen,Preset and Blind modetuning. Play Video/Audio/photos on TV from your pen-drive(USB) , if you have any dish antenna you can use with it but location should be in Free to Air satellite(GSAT15@93.5 East/NSS6@95 East(Dish TV Satellite)((No Paid Channel Received). Dish Antenna Required- We do not sell Antenna/Dish with this Set Top Box. You need to purchase that separately from your local vendor. We are not taking any responsibility or liability for working of 3rd party apps like youtube,Hotstar,IPTV etc in this Set top Box. Airtel Digital TV HD+ set top box offers you extraordinary picture clarity with the highest possible resolution of 1080×1920. It gives you a cinema theatre experience with Dolby digital plus 7.1 surround sound. Airtel Digital TV HD+ set top box comes with a universal remote which makes it easy to operate both the TV and the set top box. 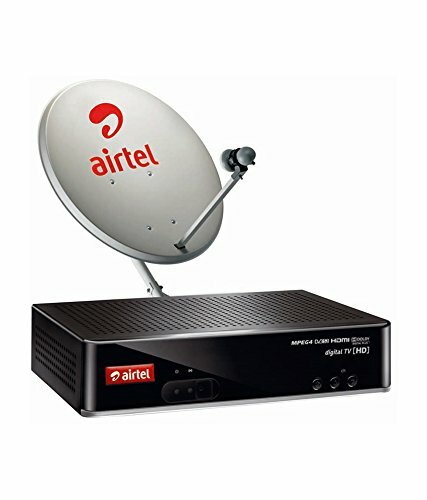 Airtel Digital TV HD+ set top box is 3D compatible. On receiving the order confirmation form Amazon, your order will be processed. You will be contacted by local authorised Airtel Digital TV technician and he will seek prior appointment from you for the delivery and installation of the product. The product will not be delivered by any courier company. Warranty is only on the Set Top Box and is covered directly by Airtel. For any issues with the product you will have to call Airtel helpline number from your registered mobile number and register a complaint. Dish TV HD+ set top box offers extraordinary picture clarity with a theatre experience with Dolby digital plus 7.1 surround sound. The product comes with 1 month free Pack!. You can record programs by attaching an external pendrive. You will be contacted by Dish TV technician and he will seek prior appointment from you for the delivery and installation of the DTH. DTH will not be delivered by any courier. While placing order, kindly provide the address with proper Pin Code where you want the product to be installed. Warranty is only on the Set Top Box and is covered directly by Dish TV. For any issues with the product, call Dish TV helpline number from your registered number and register a complaint. 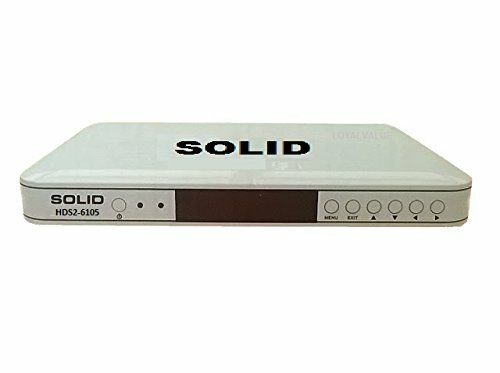 SOLID Brand launched new set-top box in attractive look and attractive price. 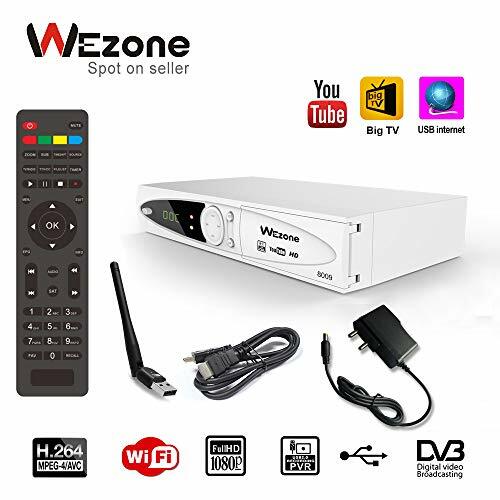 This set-top box is best for low space in your home; you can connect this free-to-air Full HD set-top box to any LED or LCD TV for best viewing experience. You can play audio or video media format from USB. (Please note: its support PVR, MP3/WMA, AVI, MKV,MP4, BMP/JPG file formats, not all). You can also play recorded media files to your computer or laptop or mobile by using VLC or MX player. This set-top box is suitable with DD Freedish, ABS Freedish or with type dish antenna weather you are using with C-Band and Ku-Band. It has very good tuning speed with latest chipset. Here is details features and Functions for HDS2-6105 set-top box. Fully compliant with the DVB-S2 digital TV Reception standards Support SDTV MPEG-2/ MPEG-4/ H.264 decoding. Support 480i/480p/576i/576p/720p/1080p. Convenient auto search function Intelligent graphical user interface design Capacity of stroing up to 2000 transponders and 4000 TV channels Support DVB-S/S2 digital TV signal modulated in QPSK/8PSK. Input frequency range 950 MHz to 2150 MHz Support DiSEqc1.0 and DiSEqc1.2 Reception for SCPC/MCPC, C/ku Band reception Fast channel selection Favourite channel Edit, parental lock Variable aspect radio (4:3, 16:9) 4:3 Pan and Scan or Letter Box modes Support USB 2.0 and OTA software upgrade. Support USB 2.0 PVR, MP3, JPG photo playback. 1. 50 HD Channels- With DishTV, you'll never run out of choices. Enhance your HD TV viewing experience with 50 HD channels across various genres to suit your entertainment needs. 500+ Maximum Channels- DishTV offers maximum channels in the category across various genres to suit your entertainment needs 2. 1080i Picture Resolution & 5.1 Surround Sound- With crystal clear picture clarity, enjoy every detail in high resolution and enhance your experience. Now, you won't miss out on the minutest detail on your HD TV with 1080i Picture Resolution and 5.1 Surround Sound. 3. Unlimited Recording- Set your own prime time by simply plugging in an external storage device (pen drive) to record and watch at any time! Use the Event Based Recording feature to record your favourite series or use Time Based Recording to set a specific time for the record feature to start. 4. Flexibility to Choose HD Add-On- Entertainment in full control with the ease of flexibility of choosing HD Add-On packs which suit your entertainment needs best. Choose your pack and enter the world of HD entertainment. 5. Power to choose: SD packs only 6. One Year DISHTV onsite Warranty , NO RETURN after Actiavtion. Physical damage not covered under Warranty.. Customer care num of DISHTV- 011-60013474 (north), 0120-2550000 ,022-60013474(west), 033-60013474(east), 044-60013474 (south) 7. 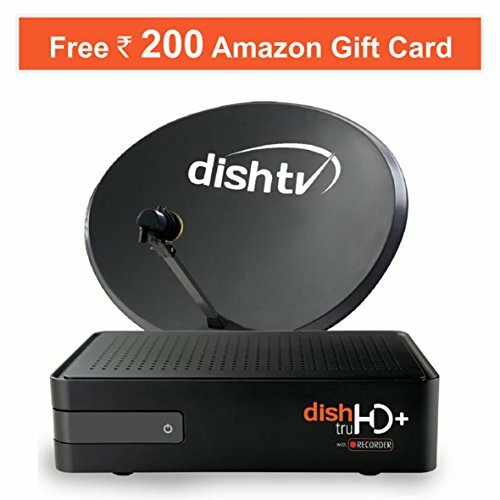 Amazon Voucher of 200 will be mailed to your registered mail id after the activation of Dish TV has been done at your address.